Create a copy or backup DVD movie is easy using WinX DVD Copy Pro. Price the full license key WinX DVD Copy Pro $49.95. But now the software is 100% free on this giveaway. On the holiday giveaway, download full version WinX DVD Copy Pro license key for free. Digiarty offer unlimited copy of the software. WinX DVD Copy Pro allow you to create DVD copy with 1:1 ratio. Don’t worry about quality lost, the software will create a perfect copy your DVD with ease. 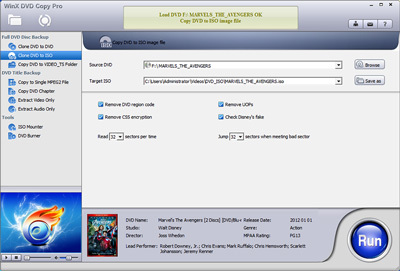 This tools allow you to copy to DVD discs directly, save as ISO, or save as folder. Unique features, it can repair corrupted or bad sector on the disc. WinX DVD Copy Pro also can remove CSS encryption, regions code, and UOPs. The free offer activity is available for one week only. Get free copy WinX DVD Copy Pro with genuine license code. WinX DVD Copy Pro Giveaway Page: Official giveaway! To download the full version WinX DVD Copy Pro is ease. Like other WinX giveaway activity. In just requires a few simple steps to get the full license key. Please visit the giveaway page to get free copy. Click on “Get License Code” button to open download page. Download WinX DVD Copy Pro with free license code. Install and activate the software using the code. Also found alternative giveaway link for the software. The offer is called pay with a tweet. . Visit the giveaway page and click on “pay with a tweet” button to get the free license for this software. With WinX DVD Copy Pro, you can create full copy of any protected and unprotected DVD with 1:1 Ratio. You can copy it directly to DVD disc, to ISO or to TS folder.